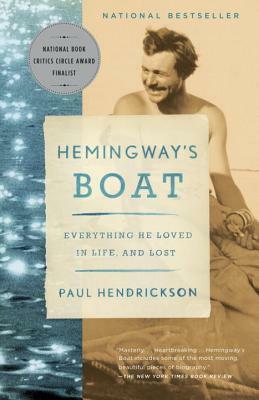 Focusing on the years 1934 to 1961—from Hemingway’s pinnacle as the reigning monarch of American letters until his suicide—Paul Hendrickson traces the writer's exultations and despair around the one constant in his life during this time: his beloved boat, Pilar. Drawing on previously unpublished material, including interviews with Hemingway's sons, Hendrickson shows that for all the writer's boorishness, depression and alcoholism, and despite his choleric anger, he was capable of remarkable generosity—to struggling writers, to lost souls, to the dying son of a friend. Hemingway's Boat is both stunningly original and deeply gripping, an invaluable contribution to our understanding of this great American writer, published fifty years after his death. Paul Hendrickson’s previous book, Sons of Mississippi, won the 2003 National Book Critics Circle Award for nonfiction. Since 1998 he has been on the faculty of the Creative Writing Program at the University of Pennsylvania. For two decades before that he was a staff writer at The Washington Post. Among his other books are Looking for the Light: The Hidden Life and Art of Marion Post Wolcott (1992 finalist for the National Book Critics Circle Award) and The Living and the Dead: Robert McNamara and Five Lives of a Lost War (1996 finalist for the National Book Award). He has been the recipient of writing fellowships from the Guggenheim Foundation, the National Endowment for the Arts, the Lyndhurst Foundation, and the Alicia Patterson Foundation. In 2009 he was a joint visiting professor of documentary practice at Duke University and of American studies at the University of North Carolina at Chapel Hill. He is the father of two grown sons and lives with his wife, Cecilia, outside Philadelphia.